In 1989 the young Roula Haidar traveled from one village to another in the Lebanese North, surveying local crafts and meeting those who still practice them. She was trying to develop ways for helping marginalized communities survive a long civil war that did not seem to have an end. Upon arriving in Kouachra, she stumbled upon Aziza who still knew how to weave the dried Halfa female leaves while still tender, and turn them into complex meshwork suitable for a variety of household uses. Roula and Aziza along with volunteering young women went to the banks of Nahr 'lkabir where Halfa leaves grew in the muddy marshes that draw the line between Lebanon and Syria. Over the course of few exchanges, l'ADL's chief designer, Maya Eid, simplified the module knot of the Halfa meshwork, while Aziza used the new knot to make her first prototype: a beach bag made out of Halfa. 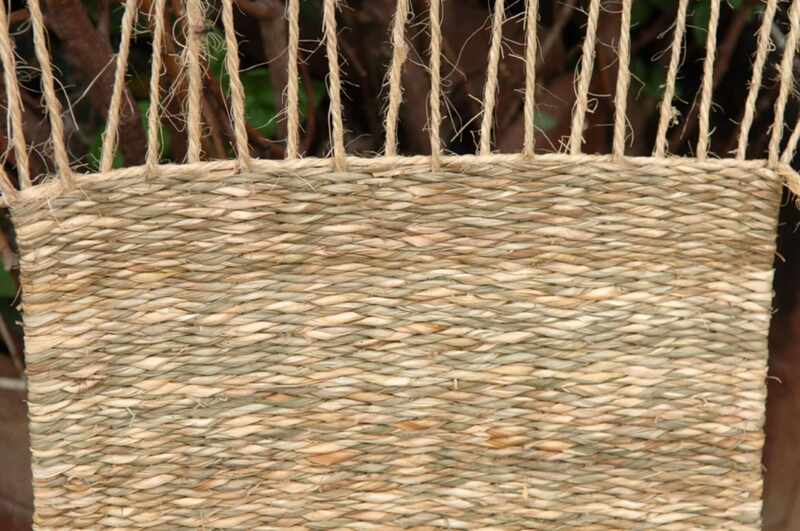 The original technique of weaving Halfa was based on raveling Halfa leaves around a rope connected to a wedge fixed to the ground. Due to the varying irregularities incurred in the traditional technique, spacing between knots in early prototypes was not uniform. Maya, in collaboration with young women in her ad-hoc training school in Kouachra, had to invent looms specifically designed for weaving Halfa, to maintain a uniform spacing between knots, and thus enhance the overall quality of the products and enable a standardized incorporation of Halfa into other crafts. The new looms enabled craftswomen to work from home, exert less physical effort and master the quality of their hand-made products. With the outbreak of the war in Syria, the muddy marshes of Nahr 'lkabir became a graveyard to those unlucky enough to fall in the range of snipers on the Syrian side. When Roula went to Kouachra for the first time in 1989, she was trying to help the local community find ways to survive a long civil war that did not seem to have an end, ironically, her project was interrupted in 2011 by another civil war that does not seem to have an end either. Most of a lot of your and effort this mistake happens due to some difficulties with the web servers that gets settled in a while but it is always better to evolve with those techniques.